This can be taken as soup also.very good to have this in summer. Pressure cook mango for 2 whistles. Remove the skin and squeeze the pulp in water. Mango would have been cooked.Boil it.Add jaggery & salt. 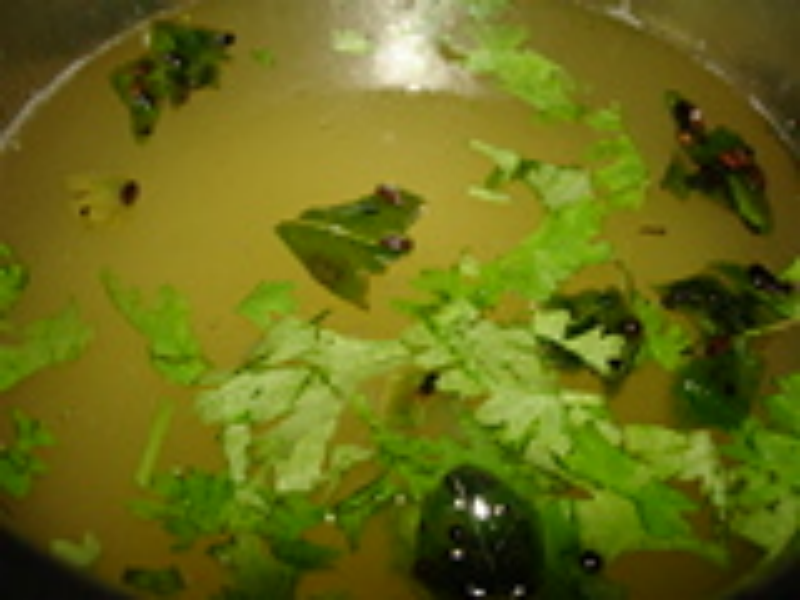 Heat oil in a kadai and splutter mustard,then jeera,ginger,green chilli,hing,curry leaves. Add this to the charu and garnish with coriander leaves. Serve with rice or can be served as soup. Roast the mango on all sides by holding with the kitchen tongs(chimta) on direct flame in the gas stove. It changes its colour. Remove the skin & squeeze the pulp in water. Boil it for sometime. add jaggery,salt along with the seasoning.stir well.Garnish with cilantro. Note: After making rice,the cooker will be hot. Take out the rice and keep this mango water in it for 10 minutes.